The much awaited brand new Seletar Aerospace Flyover together with several new roads will be fully operational for motorists later this month. This project was initiated during the 2nd quarter of 2011 and worth about S$80 million. 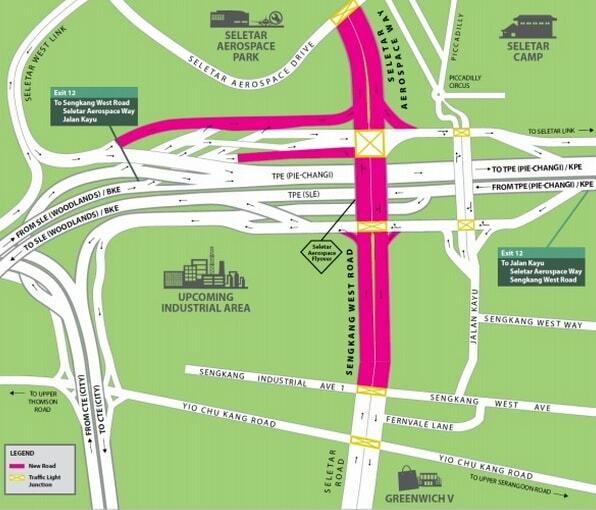 It is set to offer a much greater road connection for residents in the area, not only to the Seletar Aerospace Park, but also other major expressways, such as the Seletar Expressway (SLE), the Central Expressway (CTE) and of course, the Tampines Expressway (TPE). Because of the projected growth in population in the northern sector of Singapore, the construction of the Seletar Aerospace Flyover is to support the traffic growth in the area. An example of easier commute, motorists can now access TPE directly from Yio Chu Kang, via Sengkang West Road (the new road), instead of taking a tedious detour via Jalan Kayu to do so. As of now, it’s one of the most congested roads as Jalan Kayu is just a one-lane route (since the 1920s). And now, all these are set to change with these new routes, making lives better for motorists. This mega infrastructure on bringing better road connectivity will definitely benefit future residents of Symphony Suites, North Park Residences, Skies Miltonia and RiverTrees Residences. This entire project consist of the Seletar Aerospace Flyover, together with Seletar Aerospace Way and Sengkang West Road, which stretches across approximately 3 kilometres (km). A resident in Seletar mentioned to the press that he has been living in the area for about 40 years, and this alternative route will definitely ease the traffic conditions as heavy vehicles currently commuting via Jalan Kayu can also make use of this new road.